Elevation ranges from 600 feet above sea level in the eastern canyons to 3,000 feet above sea level in the ridges of the central and western regions. Because of the elevation drop off at the edge of the Edwards Plateau as well as its location between the dry western plains and the moist prairies and woods to the east, average rainfall varies widely from 23 inches per year to 35 inches per year. The Texas Panhandle is the northwestern most geographical region of Texas. New Mexico limits its western border, as does Oklahoma to the north and east. 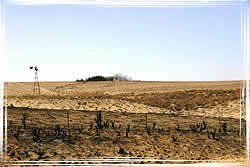 The flat north and west regions of the Panhandle are referred to as the Llano Estacado. This plain is one of the largest and most completely flat areas of its size in the world. Extending from Canyon to Silverton, is the Palo Duro Canyon, America’s second largest canyon. The canyon is approximately 120 miles long, 20 miles wide, and 800 feet deep. Early Spanish explorers are believed to have discovered the area and dubbed the canyon "Palo Duro" which is Spanish for "hard wood" which refers to the abundant mesquite and juniper trees. Soil in the High Plains is primarily heavy, clay above an impervious caliche layer with some sand found in the eastern panhandle. Soils are alkaline throughout the area which limits the types of trees that can be grown successfully. The High Plains region is primarily a short-grass prairie, also known for its shrubby mesquite, juniper, cottonwood, and agricultural crops. It is predominantly grassland; juniper, cottonwood and mesquite are predominant tree species. The rim of the Palo Duro Canyon is considered part of the short grass prairie while the elevated moisture of the canyon floor supports a greater diversity of plants including some medium and tall grass species along with shrubs and trees. Common plant species include sideoats grama, big bluestem, Indian blanket, star thistle, fragrant sumac, mesquite, cottonwood, western soapberry and hackberry trees. 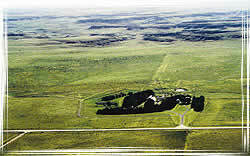 Early Native Americans understood the use of fire to improve the grass lands of the panhandle. Because of this periodic burning of the plains, wildlife (mainly buffalo), did not have to leave the area to search for more nutrient-rich lands. The fire ecosystem has always played a vital role in the panhandle. Fire kept invader species of trees at bay, while enriching the grass lands. Due to human population growth in the High Plains, fire is no longer allowed to burn. As a result, the panhandle has seen a dramatic increase in the number of juniper and mesquite trees. Fires that occur today are much harder to control, because of overgrowth of grass fuel types. 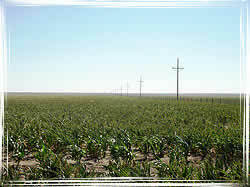 The name "Llano Estacado" is Spanish and means literally "staked plains." It is believed that the name was derived from Spanish explorers who tied their horses to stakes to keep them from wandering off. Most of the early towns of the Panhandle were established along railroad routes. 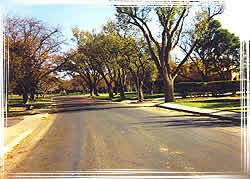 The city of Amarillo became the cultural center of the Panhandle because of the terrain-dictated routes. Railroads determined the location of towns, and ranchers were able to receive supplies and ship cattle from nearby railroad terminals. Oil and gas resources were first tapped in the Panhandle when Millard Nobles and several associates founded the Amarillo Oil Company and drilling began. The economy of the region is predominantly based on petroleum production and agriculture. Within the last decade, the Panhandle economy has become more diverse with additions such as services and high level technology.